Electronic music promoters worldwide try to cultivate a feeling of immersion. Whether it’s a claustrophobic dark room or an expansive festival field, promoters want their patrons to be able to lose themselves in the music and vibrations and forget their temporal concerns if only for a set or two. That’s why one often sees productions within existing spaces or venues that try to engage all five senses. Here lies the advantage of hosting an event with The Reliquarium at their event space and headquarters in Lincoln, Rhode Island. 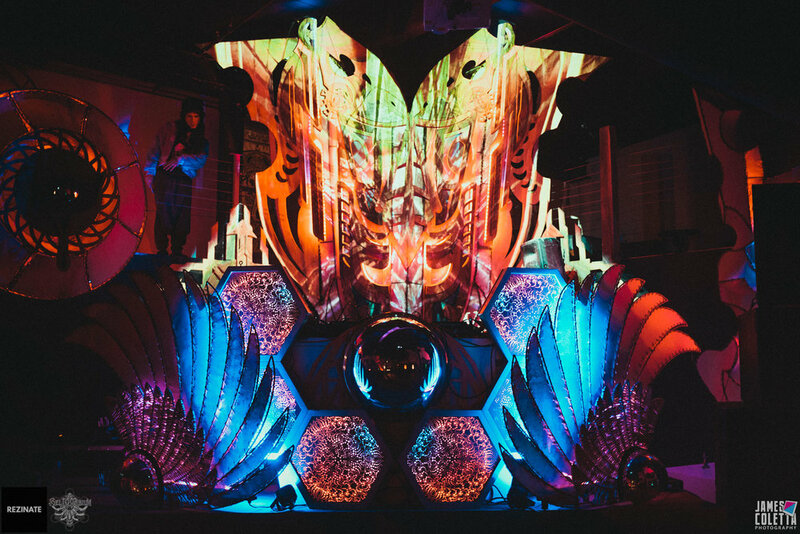 A collective of artists and designers, Reliquarium is regional go-to for stage and event design, having fabricated stages for Elements Lakewood, Fractal Fest, Minus Zero, Wild Woods, and Unifier Festival. They’ve also worked on stages further afield at Burning Man, the 2017 Global Eclipse Gathering, and Envision Festival. As the locale from which all this world-class creation emanates, their event space and warehouse in Lincoln already is the immersive environment that promoters so often try to create ad hoc. Enter The Reliquarium and you’re surrounded by 360 luxurious degrees of transcendent art, design, thought, and music. 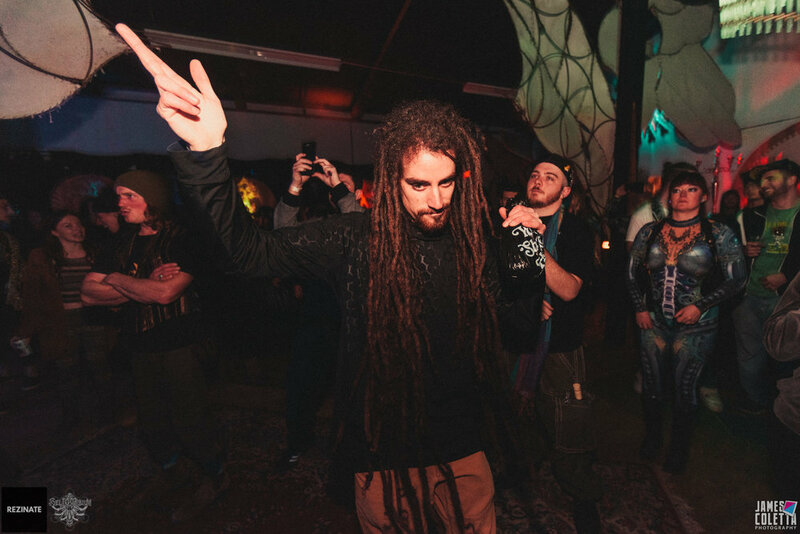 On December 1, Boston-based event production crew Rezinate partnered with The Reliquarium to host an evening of curated dubstep and drum and bass in Lincoln. The two organizations have collaborated before, with Rezinate bringing Reliquarium stage designs into the Middle East Downstairs for one show during each of their past two Fall seasons. Besides these direct collaborations, the organizations have known each other peripherally, as both are anchor points for the electronic music community in New England and the Northeast. Rezinate always carefully calculates how they bill and pair talent. This evening, though, their curation clout was approaching a new high, as each of the five DJs were also promoters and curators themselves. 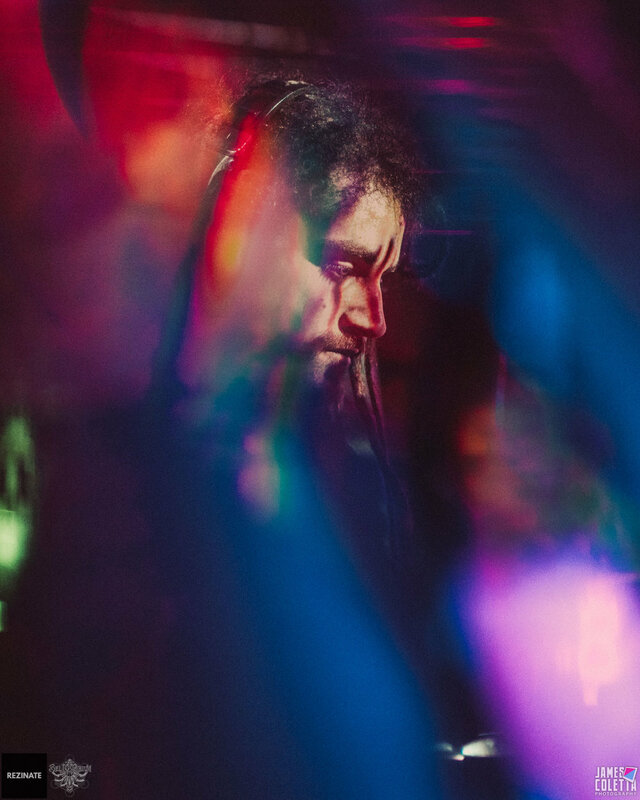 Fractaltribe member and C:\tadel founder Terraphorm warmed up the decks with a set full of mystical 140 bpm music that was both organic and industrial. He was followed by Lenore, a drum and bass legend who for 19 years has been hosting a weekly party called Elements in Boston, supposedly the longest-running drum and bass show in the world. Rezinate’s own co-founder Saltus then offered his deep, experimental fare which varied between dubstep, drum and bass, and some unique, arhythmic bass music that appeared to suspend the crowd in mid-air at certain moments. Driving through the unassuming town of Lincoln twenty minutes outside of Providence, one’s arrival at The Reliquarium is signaled by purple and pink lights peeking out of the great glass windows of a red brick factory shining out towards the road across a pond. Upon entering the venue this night, one would have been greeted warmly by Ivy Ross, co-founder and matriarch of The Reliquarium, before moving into one of the space’s two main rooms. The entire building is elegantly adorned with hulking sculptures and designs - pieces plucked from the group’s famous event stages - and some pieces that are likely fabricated just for the event space. One room houses a vaulting, illuminated main stage that rivals in beauty if not in size any design that the team has taken on the road. Terraces flank the stage offering space for dancers and LED performers to spin and twirl and creating a nightclub dynamic. Beneath the terraces stood Hennessey Sound Design stacks. 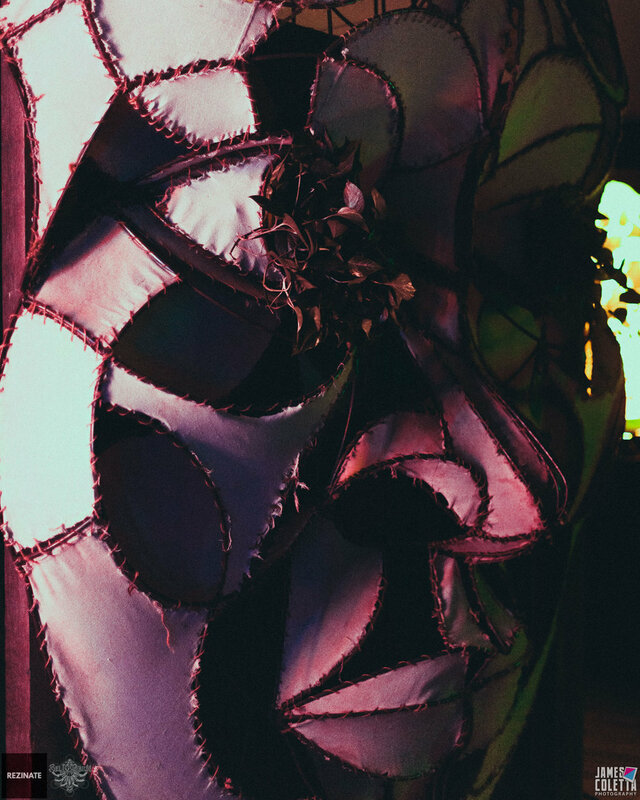 Their designer Sean Hennessey could be seen moving through every square foot of the room throughout the night, gauging the strength and fidelity of the sound. In one corner, a gigantic, fabricated face lords over the dance floor. In the opposite corner sits a grand piano next to a dark wooden bookshelf where tarot decks and texts on art and pharmacology share space with “Home Remedies for Dogs and Cats”, the Alcoholics Anonymous Big Book, and “Natural Healing Wisdom and Know How”. More hand-crafted and illuminated installations on the walls and ceiling change colors throughout the night, helping to create a space that is as dynamic and alive as the 200 or so people dancing within it. The second room, formerly an artist’s apartment, houses a second gorgeous stage, although it was not utilized on this evening. Instead of a dance floor, then, there was an expansive living room environment with sinking leather armchairs and antique coffee tables, plus an elixir bar and third party vendors and painters aligned along the walls. Sound from the main stage is pumped into this second room at an audible but not overwhelming volume. The result of all this? One can enjoy the evening’s musical fare from the comfort of a couch, dazzled by live painting or an illuminated Reliquarium stage design, while catching up with friends and enjoying a homemade elixir (the “Love Potion” came highly recommended, with a shot of espresso and a dash of lavender syrup). Headlining the night was The Librarian, co-founder of the Pacific Northwestern festival Bass Coast. She, too, offered a hodge-podge of styles mixed with effortless grace and an impressive attention to detail. Our favorite set of the evening, though, came from Naasko, a curator for the Canadian label Interchill Records. He played approximately 50 minutes of slicing, intergalactic drum and bass full of masterful sound design. For the last ten minutes, he scaled down to dubstep and dropped the weightiest and most spacious bass of the evening to cap off the show. 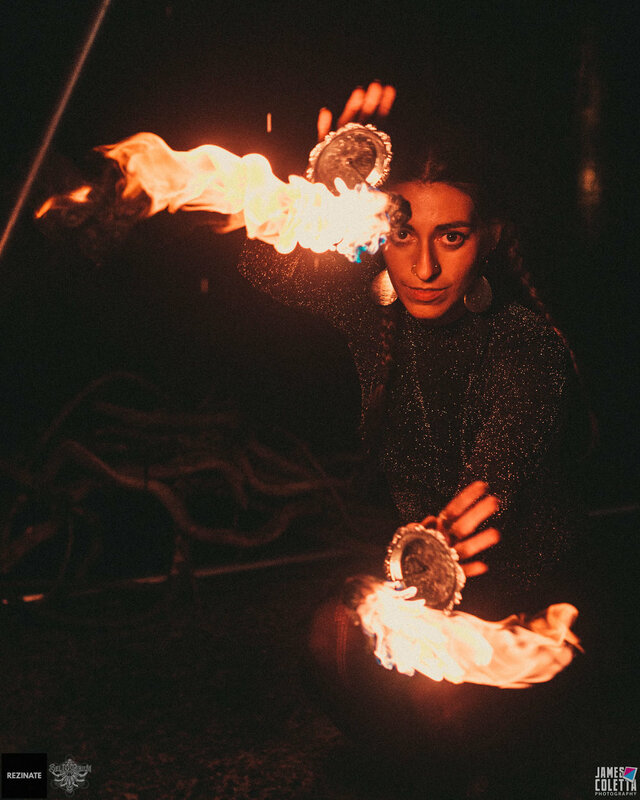 Keep your eyes out for events hosted at The Reliquarium in 2019, for more well-curated nights from Rezinate, and for potential future “Reziquiarium” collaborations. With a keen sense of self-awareness and an abiding respect for one’s hosts, Northeastern heads who enjoys psychedelic electronic music and its corresponding counter culture should make a pilgrimage to The Reliquarium’s headquarters at least once.